Dalma Wildlife Sanctuary, a locally well known sanctuary spread over two districts viz. East Singhbhum and Saraikela-Kharsawan, is one of the last refuges of Indian Elephants in south-eastern Jharkhand. 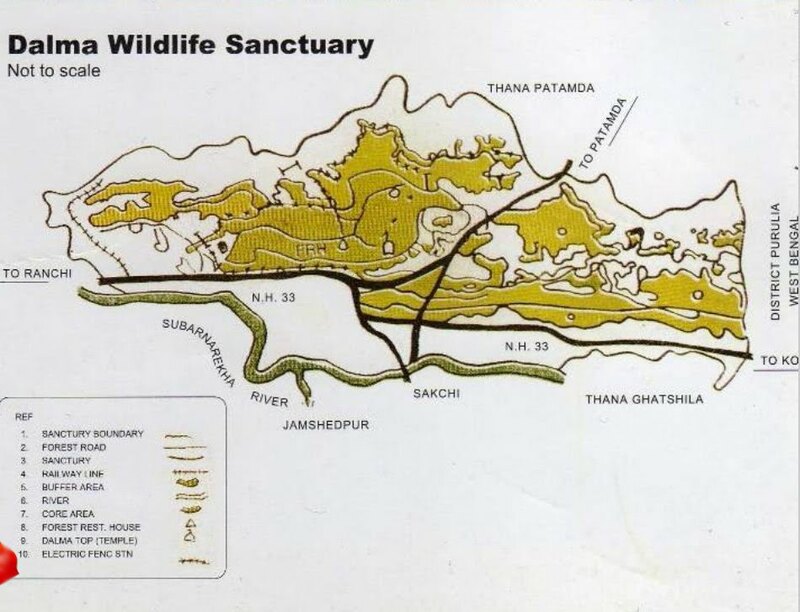 The 193 sq.km WLS is a part of the much larger Singhbhum Elephant Reserve (which encompasses 13,440 sq.km area out of which 4529 sq.km is forest area and is home to ~317 Elephants according to the 2007 Elephant Census).In summers, this sanctuary is home to as many as 80-90 elephants. Dalma’s forests serve as a “summer encampment” for the 60-70 member strong elephant herd that annually moves along an ancient migratory route which was once spread over West Bengal and Orissa. Apart from elephants, the sanctuary is also home to a leopards (extremely few), bears, hyenas, giant squirrels, foxes, jungle cats, barking deer, wild-boars, civets, macaques and an array of birds. A Tiger was sighted in 2004 by Mr. Koleshwar-- one of the most experienced forest-guards of the WLS (most probably it had strayed from North Orissa or SimilIpal). This was the first instance of a Tiger sighting in Dalma forest area in more than 40 years. 1) NH-33 highway that runs along the southern end of the sanctuary (i.e. along the foothills of the southern-face of the Dalma hills). This highway is proposed to be converted into a 4-laned highways. 2) The railway line that runs along the western end of the sanctuary. The single track line is proposed to be converted into a double line track. 3) The biggest threat is the Subarnrekha-Multipurpose project as a canal has been partially constructed along the foot-hills of Dalma Hills. The project started in 1982-83 in violation of all the forest and wildlife acts. The project later got the Stage-1 clearance from the MoEF and the canal construction has been more-or-less completed in non-sanctuary areas (which includes both forest and non-forest lands), the 145 hectare forest area that falls under Dalma WLS unlike the other parts of the canal has been only dug up but hasn’t been concreted. Moreover, once this canal is constructed, several smaller canals emanating out of this main canal will be constructed which will further fragment the corridor elephants use—basically it will completely destroy the corridor. The effects of this canal have been catastrophic on the annual elephant migration to Dalma. Recently the herds of migrating elephants were stranded as their traditional entering routes into the Dalma WLS have been blocked by this canal. As a result, the bewildered herds have started raiding crops and villages, hence exponentially increasing the man-animal conflict in these areas. Moreover, the rapidly deteriorating law and order situation in the area and the huge staff shortage (60-70% vacancies) add to Dalma’s woes. The future of Dalma forests and its elephant seems really bleak as conflict is bound to increase in the coming years due to the aforementioned canal construction. Right from its onset, the canal construction project has flouted a number of forest rules. The Wildlife Division tried declaring an area of 10kms around the sanctuary as an “eco-sensitive” region to stop this canal construction, but this proposal was quashed by the high ranking Wildlife Division officials and the state due to the political pressure exerted on the forest department as well as the government by the Jamshedpur Vyapari Sangh and the Water-Resource ministry & department. The government declared that the clause of “no construction within 10 km radius of a WLS” was meaningless for Dalma because the “areas around Dalma WLS are already degraded and aren’t used by elephants or any other wildlife”. Hence the clause as well as the Wildlife Division’s “eco-sensitive” region proposal was dismissed. “ The canal construction has been done based on contours and hence includes forest land that is outside the sanctuary limits (i.e. in territorial division), 145 hectares of forest land in Dalma WLS and non-forest land as well. Even though unlike in territorial and non-forest land areas where the canal has been concreted, we haven’t yet let the project-authorities to do the same in the 145 hectare forest of Dalma WLS, but they had already dug up the land for the canal in this 145 hectare area years ago. We tried declaring a 10-km area around Dalma WLS an “eco-sensitive” zone to prevent the canal construction, but the state dismissed this proposal. The damage has already been done, traditional routes used by elephant herds to enter Dalma have been blocked by the canal and as a result the herds have raided villages and fields in the area, thus exponentially escalating the elephant-human conflict. Once this canal is completed, several smaller canals will be constructed to provide irrigation water to fields and villages. This will completely fragment this area and basically destroy this ancient corridor forever. The damage already done by the canal-construction work is irreversible. Moreover, a complete halt on the project forever say on the lines of Kundremukh is unlikely because of the huge political ramifications such a move would have in this area, for this project is being contrived by the authorities as a people’s-project aimed at providing irrigation-water to the poor Tribals of this area. Completely taking down this canal construction project would immediately cause the leaders to label it as an “Anti-Tribal” move. Perhaps the only small respite is the fact that we have forced the Water-Resource department to construct 12 over-passes on the canal for safe wildlife-passage. I have personally visited the sites where we have ordered the construction of those 12 overpasses on the canal---some of these will be in the territorial forest-corridor adjoining Dalma, some in Dalma WLS’s forests and a few on the non-forest land that are used by elephants during their migration. We have also uploaded the co-ordinate locations of the proposed sites for these 12 overpasses on Wikimapia so that anybody and everybody can see the exact location of these 12 overpasses for themselves. But personally I feel this is a mere symbolic move for I’m quite convinced that these big wild-animals especially a highly intelligent animal like elephant will not use such artificial constructions. To somewhat counter this seemingly hopeless situation, the government needs to be forced to actualize 3 conditions that might help reversing the damage that has been done. It’s imperative that these three conditions are forced upon the government and the project-authorities by the NBWL Standing Committee, without the compliance of which the project should be put under a moratorium”. 1) Immediately fill the staff vacancies for Dalma WLS. Dalma has a ~70% staff vacancy, the NBWL SC should force the government and project-authorities to completely fill these vacancies before any further construction work is allowed. The canal-construction work must be stopped until these vacancies are filled. 2) To compensate for the 145 hectares of vital elephant-corridor forests being transferred for the project, the government had originally agreed on adding 9000 hectares of forests (adjoining Dalma WLS) of the Chandil and Saraikela-Kharsawan forest division into the Dalma WLS. These reserve forests are vital elephant corridors. However, later on the government went back on this promise and decided that they would only add 1400 hectares of adjoining forests of Chandil Division. The NBWL SC must force the government and project-authorities to add 9000 hectares of forest into Dalma WLS as originally proposed. Until this is done, the canal-construction work should be put under a moratorium. 3) The Subarnrekha Multipurpose Project (of which this canal-project is a part) also includes construction of two dams viz. Chandil Dam (already constructed) and Ichagarh Dam. Once the project is completed, some forested area of two reserved forests adjoining these two dams will be submerged. What should be done is that the NBWL should force the government to notify these two reserve forests (that are regularly used by elephants and other wild animals) as a Widllife Sanctuary. The combined area of these two reserve forests (and hence the area of the Wildlife Sanctuary that must be notified ) is roughly 200sq.kms. Only when the government meets these 3 conditions should the moratorium be lifted and further construction-work be allowed.